What would a week be without another game-changing update to Fortnite Battle Royale? Just another week, I’d imagine, but best not to dwell on worst case scenarios like that. Instead, let’s have a look at what’s new in Patch 3.5, which has been rolled out by Epic Games today, and comes bearing lots of big changes to the crafting-survival deathmatch formula that the game now has a monopoly over. The big stuff first: the much talked about Port-a-Fort, a grenade which instantly creates a metallic sniper’s perch when thrown, is now available in the game as an item. That means you’re about to see a lot more towers than you might be used to, though it’s not yet clear how rare an item the Port-a-Fort is, or how quickly it builds said tower upon hitting its target. With the in-game video editing software, players will be able to speed up and slow down time, hop between multiple perspectives, tweak with filters and camera settings, and toggle information like player outlines and name plates, all in the name of creating the perfect replay. In the patch notes published on Epic’s website, the studio also teases the possibility of competitions and prizes for those who create memorable films via the Replay system, so reliving those Victory Royales isn’t just an erstwhile pastime, but a chance at nabbing some real life Fortnite loot. And finally, the limited event known as 50v50 Mode is back and better than ever, with an updated variant called 50v50 v2. 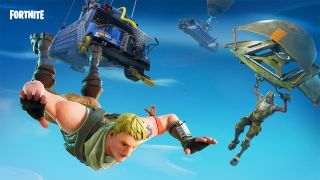 No, that doesn’t mean two teams of 50 players are up against a very unlucky duo, but version 2 will offer new tweaks to the old formula, such as two different Battle Buses, more loot, and a more aggressive storm. As expected, Epic has also brought in a number of smaller hotfixes to Fortnite with Patch 3.5, all of which you can read in full on their website. TLDR? Here’s the main stuff you need to know; Loot Llamas can now be opened with destruction as well as interaction, there’s a new Squad Comm wheel for communicating with strangers in your team, a Builder Pro controller configuration is available on console, and you’re now able to distinguish friendly traps from enemy ones, thanks to a blue tint painted across the former.